When those chilly autumn winds start to blow, thoughts turn to cozy and unique ways to get warm but still enjoy the scenic panoramic views and crisp, clean air of the season. One way to knock off the chill of fall and take advantage of mother nature’s beauty is to take a dip, or two, in your very own hot tub or spa. The soothing warm water and sound of the bubbles can not only work wonders on your muscles but your spirits as well. Imagine soaking in your spa with the harvest colors of autumn as you backdrop enjoying a glass of your favorite beverage while wafts of steam mingle into the cool air that surrounds you. This imagery sounds tantalizing enough to the senses but the location and surrounding area around your hot tub or spa can really make or break the whole experience. Incorporating a deck or patio into the design of your hot tub’s location can really improve the appeal and aesthetics of your entire backyard. Hot tub decks and spa decks help turn the functionality of the hot tub or spa into a total experience. 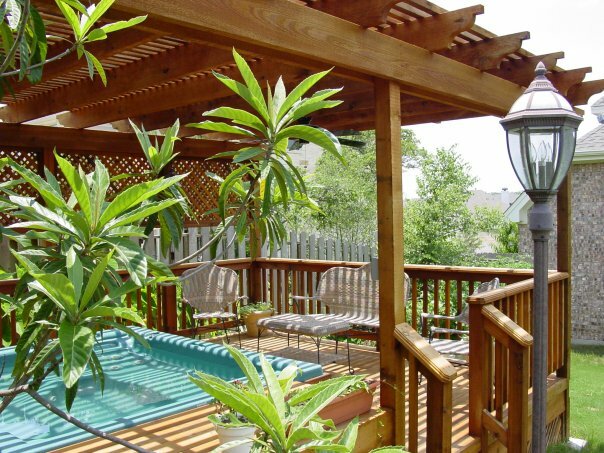 A deck can add valuable outdoor living space for entertaining , grilling and dining as well. When you think in terms of how you will use your spa or hot tub deck it is important to factor in the little nuances that will add to your enjoyment of the spa. Hot tub and spa decks can be built to include storage areas for towels and other accessories you will need when the spa is in use as well as built-in bench seating for sitting and removing your shoes so, if you so choose you can just dangle your feet over the side of your spa if you don’t feel like taking the whole plunge. The variations and range of hot tub decks and spa deck design is endless. We pride ourselves on thinking outside the box when it comes to getting the most out of your deck’s design even moving the hot tub or spa out of the usual centered location on the deck and placing it in a location within the deck that will give you better views while using your spa and create more usable deck space for other outdoor living endeavors. If you are considering a hot tub or spa deck one important consideration is the decking material and the underlying strength that is needed to properly house a hot tub or spa. When the spa or hot tub is filled with water it will add a tremendous amount of weight. 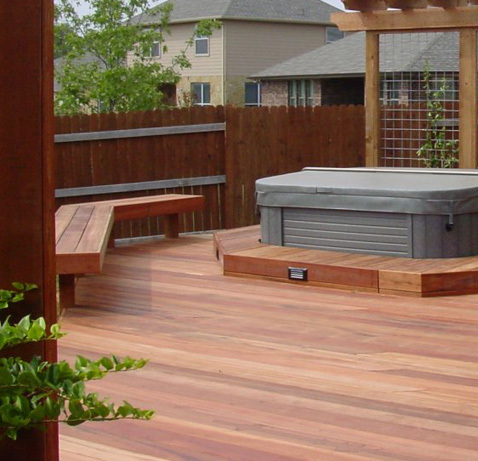 Archadeck pays close attention to these needs and added requirements and builds a spa support deck with many of our hot tub and spa deck installations. 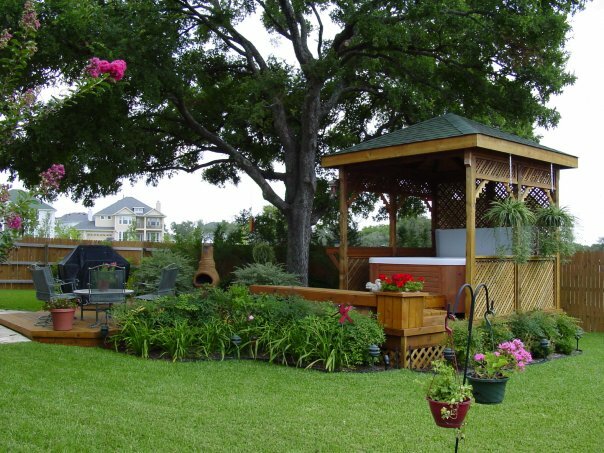 The use of a support deck will take the excess load off the deck itself and make the deck and the hot tub or spa safe and free of any areas that might compromise your structure. Archadeck of Fort Wayne recently installed a spa deck for homeowners that wished to incorporate a Micheal Phelps swim spa into the decks design and as you can tell by reading the article about this particular installation, that if you are thinking of buying a spa strong enough for Micheal Phelps then it is important to have a deck that is equally as strong. When considering materials for your hot tub or spa deck you want to choose a material that is kind to bare feet and will not splinter or retain an excessive amount of heat. Another key factor is reducing or eliminating slippage when those bare feet exit the hot tub and are wet. There are many high quality decking choices available for use on spa decks that offer little or no heat retention and decrease slippage. Some key considerations to remember when you make the choice to build a hot tub or spa deck are you want the hot tub or spa to be where it is 18″ above the deck and not flush to the deck so you will be able to sit on the sides and swing around when necessary. You also want to ensure you can enter and exit the deck from all sides with adequate walk-around room at a minimum of 4 feet , by having 6 feet you will have room for bench seating to sit down and remove your shoes, etc. Another key element in good spa deck design is never place your spa deck under a window because it will become an eyesore when looking out from the interior of your home. 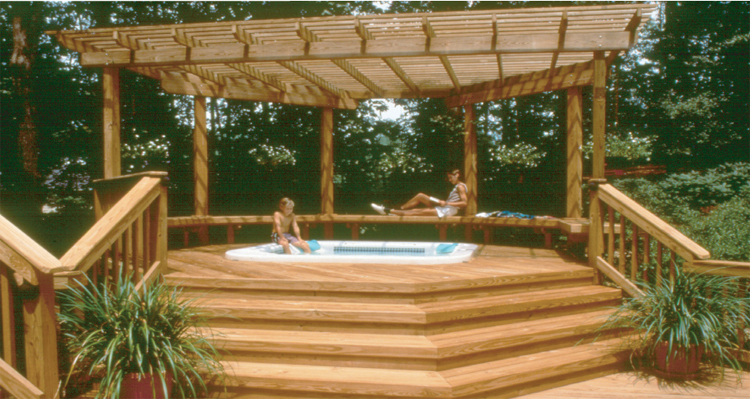 If you are ready to take the plunge by building a hot tub or spa deck then contact Archadeck to learn more. We can design and build a hot tub or spa deck that will make you never want to leave the comforting warmth of your hot tub or spa when it is surrounded by the beauty of one of our masterpieces of deck design. This beautiful covered porch by Archadeck of Fort Worth takes advantage of the light afford by the addition of skylights. The outdoor structure has evolved, now I don’t mean a “Darwin” type of evolution but rather an evolution of style and luxury. Many of the same pampering elements we enjoy within our homes is available in our outdoor rooms as well. Screened porches, covered porches and patios, sunrooms and 3 and 4 season room have begun to receive the royal treatment in terms of the accoutrements that are now commonplace among professional outdoor structure builders. Features such as wrapped beams, decorative columns, detailed ceilings, ceiling fans, recessed lighting and all the outlets, plugs, areas reserved especially for your HD flat screen TV’s, and more multi-media hookups than you could ever imagine are being seen within today’s outdoor structures. These features, make for convenience and are oh so easy on the eyes to boot. 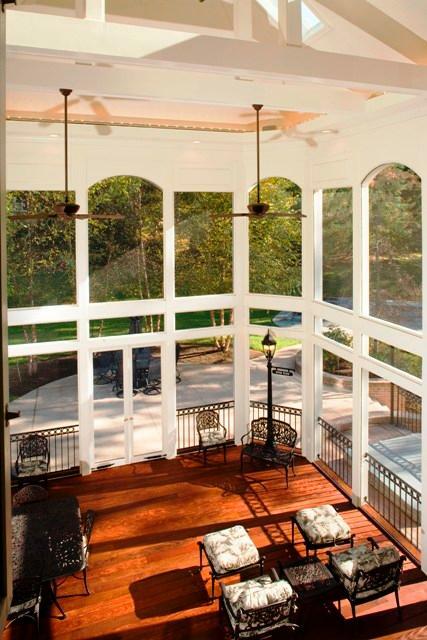 This magnificent screened porch by Archadeck of Maryland uses skylights to add additional height to the vaulted ceiling, this result is open and airy. One such element that we often install in our outdoor structures is the skylight. Gone are the days of the skylight just simply being a skylight. Sure, they allow for your structure to receive more sunlight, which really opens up your space and gives the space a feeling of airiness. But today’s skylights offer many other features as well. Velux skylights are the skylight of choice for many of our Archadeck locations throughout the country, and for good reason. 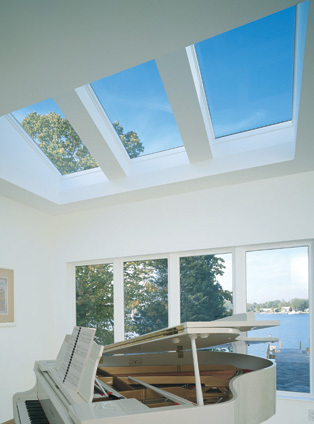 They offer high quality skylights with a myriad of available features with your convenience in mind. The Velux skylight slogan is “add drama to any space”, and Velux definitely delivers on that promise. With a 10 year no leak warranty and features such as remote control operation, insect screens and blinds that are built right with choices like classic venetian blinds to systems that block the light entirely. Velux skylights also offer an open and close feature that comes with a sensor that detects the first raindrop and automatically closes the skylight so you don’t have to. Imagine sitting on your lovely screened porch enjoying a mild autumn afternoon with your skylights open enjoying the fresh air and the blue skies. A scene like this is reminiscent of that first drive in a Corvette with the T-tops down, a “wind in your hair” kind of freedom that is unforgettable. We’ve all been there. We eagerly await going out on the screen porch for some morning coffee or to do our daily crossword puzzle or relax for a few minutes and grab the sports scores or weather before heading out for the day. Only some days, mother nature puts a damper on those plans. Maybe you live down south and are greeted with a yellow covering of dust all over everything. Maybe it rained last night and there’s a faint moistness to your fabric-covered chairs. Maybe it’s just too darn cold out there. There is a way to “convert” your screen porch without having to sink a fortune into windows. There is a company called Eze Breeze that has a convertible enclosure system allowing you to convert your screen porch into more of a multi-season room. These screens can add protection from temperature as well as the elements. 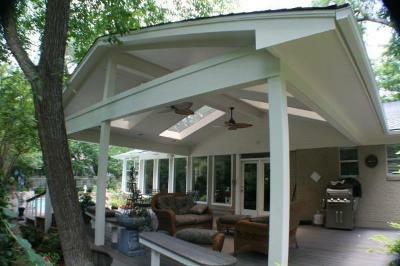 We have been using this system for homeowners who want to get access more time on their screened porch. Eze Breeze systems are easy on the eye and on your wallet in terms of adding more seasons that you can spend on your porch. Extending the time frame for use in your screened porch is not the only reason many homeowners are using the Eze Breeze system, other factors are influencing their decision as well. Let’s face it, sometimes you want the freedom of the screen but you don’t want the negative things that can still get through that screen. Screens keep out the insects and the harmful direct rays from the sun but pollen still comes through a screen, as does the wind, some the rain and the cold. Eze Breeze makes it possible to enjoy your porch without those negative factors getting in the way of your enjoyment. When the weather turns cold, you can also add the use of a space heater within your porch with Eze Breeze and turn your structure into a 3-season outdoor living room as well. The beauty is that anytime you want to take advantage of the favorable weather or an unobstructed view, this system can be slid out-of-the-way either horizontally or vertically, depending on which system you have, to get you back to the very reason you wanted a screened porch in the first place – to be closer to mother nature and take advantage of all that fresh air. Eze Breeze is strong and durable. Eze Breeze enclosures are easy and affordable, here’s how they work- the system is made from 10-mil vinyl glazing that gives you the same clarity of glass. This innovative material is not susceptible to cracking or breaking and with many mishaps will return to its original shape within minutes. The enclosures can be installed either horizontally or vertically and the panels can be slid out-of-the-way to obtain a unobstructed view and take advantage of the “feel” of nature. Eze Breeze presents homeowners with a win/win answer to having your cake and eating it too! Privacy fences and enclosures don’t need to be ugly any more – see some beautiful pictures! When I think of privacy fences, for some reason the first thing that pops to my mind are those terrible walls that you see on the side of a highway which are likely created to contain the noise of the highway. If someone steers my thinking to a privacy fence for a hot-tub, I generally think of something that looks like 3 8-foot fence walls that are bought at Lowes or Home Depot and put together to create hot tub privacy on 3-walls. At Archadeck of Austin, this is just one of their specialties. Take a look at some of these photos to dispel the myth that privacy fences and enclosures need to look functional. Functional can be really beautiful if designed right. This hot tub enclosure is designed with a cover for shade, one privacy wall to hide the surrounding fence, two partially open sides, an adjoining bar, and an open side for easy access to the hot tub from the deck. Here’s another view from the side. One of the nice things about the way they design privacy enclosures in the Austin office is they only put full privacy walls where needed. If you look at the back of this picture, you will only see a partial privacy wall. This privacy wall is designed to block only what they don’t want to see – which is over the barrier fence. 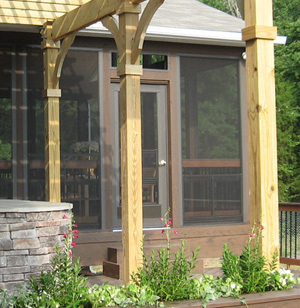 The pergola provides a great structure to attach the partial privacy wall to. One of the things that can make a privacy wall an eyesore is how it’s finished at the top. 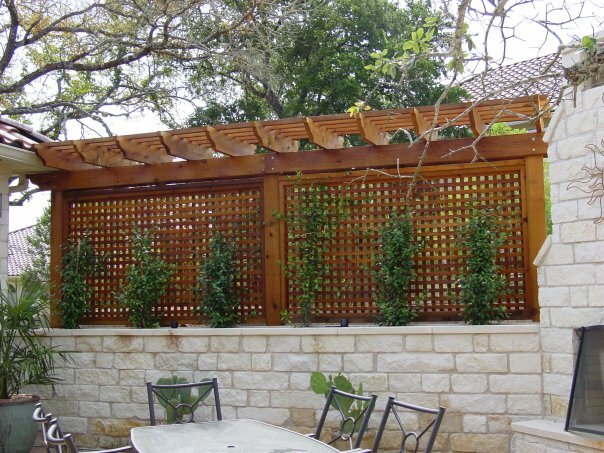 In Austin, they often finish the privacy walls with a pergola style top as you see here. This wall is a beautiful and very functional addition to the stone wall. 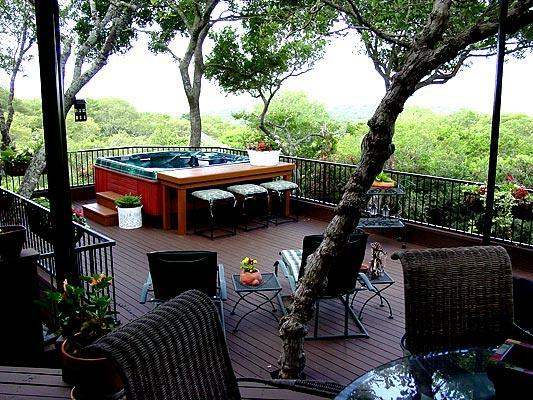 Archadeck of Austin is owned by Jim and Julie Odom. Give them a call for composite decks, tigerwood decks, cedar decks, pressure-treated decks, flagstone patios, stained concrete patios, covered porches, front and back porches, or to build your own custom outdoor structure for your backyard.